By embracing messaging channels, companies will immediately benefit from an “eternal conversation thread” with their customers. Chatbots can provide real value to companies when properly conceived and have a tremendous amount of potential to support a business’ customer service efforts. Fact #1: No one enjoys repeating themselves, waiting on hold, or even calling businesses in the first place. By embracing messaging channels, companies will immediately benefit from an “eternal conversation thread” with their customers, as past conversations are always present through the message history. So customers no longer have to wait on hold for the next available associate, instead they can engage in a conversation with a chatbot first, and then, if needed, request that an agent continue the conversation with them via messaging, or take it to the phone channel instead. They will then receive a phone call from a live person who can pick up exactly where the conversation has left off. No hold times, no repeating themselves, simply a convenient and preferred interaction for your customer. Fact 2: The most expensive cost factor in the contact center is labor. Many customer service agents handle mundane, repetitive tasks like pre-qualifying calls (asking what the customer is calling about) or authenticating the customer (figuring out who is calling) only to then answer a simple question like: what is my balance or has my order shipped? Human agent performance declines when confronted with boring repetitive requests, yet thrives with engaging challenges and according to recent survey from Aspect, 70-80% of a contact center agent’s day-to-day calls are easy or moderate. Agents shouldn’t continuously be answering simple questions or occupying their time with mundane tasks for extended periods of time; in the same way, bots shouldn’t be doing complex work requiring some level of human empathy and creativity, like solving a complicated service issue or calming an angry customer. In the world of customer service, human agents and the digital employee (bots) should co-exist and enhance each other’s performance. On the operational side, bots have a similar value proposition to good old IVR (Interactive Voice Response), such as saving cost, while offering the additional advantage of being an engagement channel customers enjoy. A typical customer service inquiry “where is my order” (WISMO) on average, with an agent, costs the business $2.50 – could even be higher. A digital employee can have a message-based conversation and go beyond answering the WISMO inquiry. 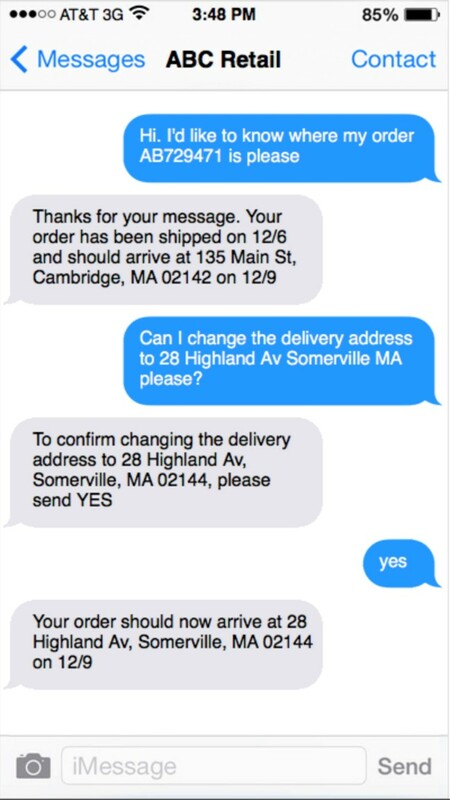 In the example below, the digital employee is also changing the delivery address. If we assume the cost per message, both ways, comes out to 2 cents with four messages back and forth we would be at $.08. 8 cents for a digital employee vs. $2.50 for a regular employee comes to savings of over 95%. Now, let’s assume the company handles 5000 inquires a day and through advertisement and word-of-mouth, 20% of your customers now use messaging instead of calling. That comes out to $2500/day (or $912k a year) when using live agents. Compared to $80/day (or ~$29k a year) when using a bot. Bottom line: the initial cost of developing the bot aside, following this model, the company can save over $880k with a chatbot! As mentioned before, these numbers shouldn’t come as a surprise to those familiar with automation in the contact center. IVR only costs approximately 1/10th of an agent, so it makes sense that ITR would reduce the cost even further by moving from voice to messaging. WISMO inquiries are the number one reason customers call retailers and because entering in a alphanumerical order number is difficult over IVR, many of these inquiries are still handled by live agents today. With chatbots, what you type is what you get, so new use cases become possible that weren’t feasible or affordable with IVR. 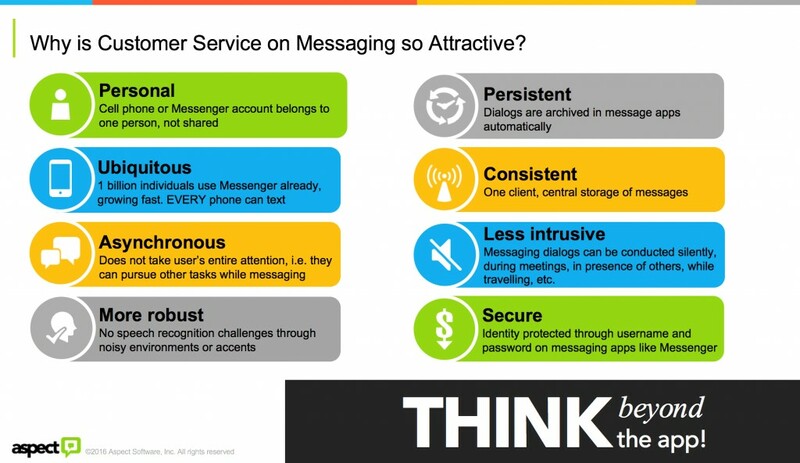 Lastly, CSat (Customer Satisfaction) and NPS (Net Promoter Score) can be positively impacted simply by introducing convenience through messaging. Just a few points can greatly impact an organization, especially as customer experience becomes a distinguishing factor. Tobias Goebel is the director of emerging technologies at Aspect Software. He is a frequent speaker and blogger on topics around customer service and, more recently, the (re-)emerging chatbot, NLP, and AI technologies. Tobias holds degrees in Computational Linguistics, Phonetics, and Computer Science from the universities of Bonn, Germany and Edinburgh, UK . This article was originally published on BD Tech Talks. Read the original article here.